Yeah I know… Bobby on the blog on Friday, Bobby on the blog on Monday… gross. Way too much Bobby. Don’t worry, after this we’ll go back to trying to pretend like he doesn’t exist. This story is important, though. 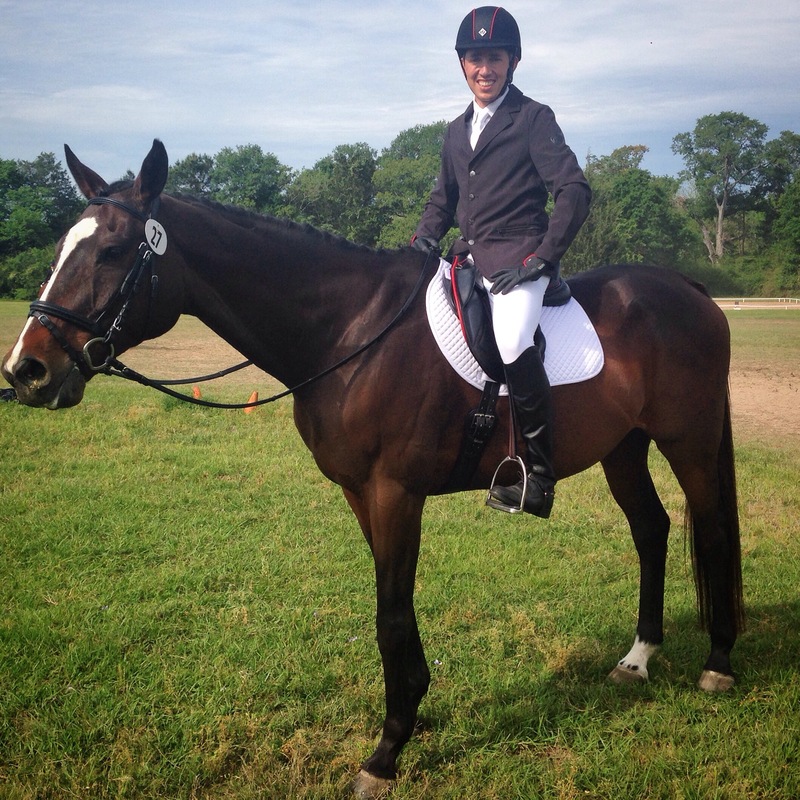 Bobby’s birthday was Saturday and he chose to celebrate it by entering his first USEA recognized Training horse trial. I can’t remember how old he is, so I’ll just go with a safe guess and say 75… something in that ballpark anyway. I had to sit this show out for budget reasons, but since I’m such a good friend I drove out there to cheer him on and bring him his birthday present. Most of you probably remember that his big birthday present was his custom saddle from his BF Dustin. The black and red looks really good, I have to admit, especially with his fancy helmet. So I decided he needed one more really nice coordinating accessory and bought him black and red Roeckl gloves. Light years better than the cheap fabric ones he had before. As usual, I’m doing my best to make him more fabulous. As for the show, it went really well and Bobby finished 2nd. He had a solid dressage and Halo hopped around the XC like a champ, although I think he gave everyone a heart attack in stadium. Pretty sure they hit almost every jump but somehow didn’t actually knock any down. One even popped up out of the cups and then settled right back in them. I’ve never seen a luckier person in my life. But the best part was what the announcer said when he finished his round… “He polished all the poles!”. Is there any comment more fitting for Bobby? I immediately fired off with “Those aren’t the only poles he polishes!” and Dustin said “How do you think he got that saddle?”. The crowd was delighted, but no one more than me. Bobby shall henceforth officially be known as The Pole Polisher. I just LOLed at my desk…. Thanks for a great start to my Monday 🙂 Love those gloves. Bobby is looking sharp! Glitter IS the STD of craft supplies, after all. happy birthday, and congrats on a super ride and AWESOME present haul! This is the best! The matching gloves were a great gift! He looks so classy! With a name like that we will have to buy him the ‘handicorn’ I found. This is fantastic. My colors are also red and black so I’m super jealous of his get up… and the fact that he didn’t take any rails! Can Bobby be in every blog post from now until forever?! I love him! HAHA!! Amanda hates me too much for that! Hates me so much that she drove out to my first Training with a glitter bag with awesome gloves and cupcakes. Having her ‘hate’ you is actually a good thing I’ve found! So we have a chance! Dang, I hope I get on her bad side someday…. Ummmm the obvious next step is custom boots with just a touch of red piping. Just saying. I already showed him some like that! I know!! I’ve gotta stop finding things I need if I am going to get Halo and I to Coconino!! The best part about his new nickname: it can be horse show with children around level appropriate. But the other best part: it can be dirty and hilarious as well. Win win. “will polish poles for boots with red piping” totally adult and child appropriate language. There is still glitter in my car from that princess bag!! I even had some on my saddle when I emptied the trailer!! Glitter is the herpes of the craft world. I don’t want your herpes! You must be talking to yourself again. I have to say, I thought the glitter princess bag would explode with paint or corgi poop or something like that…. but when she said I could open it while I was standing next to Halo (who she does actually like) I figured it was safe. Much to my surprise were the most amazing gorgeous red pipe lined gloves!! Only after putting them on did I think they may be acid lined… but again, they’re so beautiful, I knew she wouldn’t do anything to destroy them. And if pole polishing gets me a custom saddle and fancy new gloves. POLISH AWAY, YA’LL! Goddamnit, don’t make me laugh like a loon at the doctor’s office. Hahahaha! This is the best post ever. Pole polisher… I die! Also, where does one find Roeckl gloves with colored trim? Rule 1: Don’t read Bobby stories at work. Laughing like a fool and no one I can share this with as they just won’t get it. Good luck on the boots.